Our pupils move seamlessly from Infants into Juniors, and where there are two classes in a year group these are located close to each other to encourage cooperation between children. The school day begins with registration at 8.45am and finishes at 3.30pm. A freshly-prepared health and nutritious lunch is provided by our chef and her team along with a snack at mid-morning break. There are many before and after school clubs and activities that extend the school day. The day is structured to provide a balanced mix of academic, physical and creative experiences. We increase the homework assignments from Year 3 to encourage the pupils to work independently and to reinforce their learning. Junior pupils develop very close relationships with their form teachers, who are responsible for their day-to-day welfare, academic progress and social development. 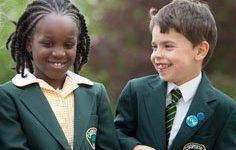 The School Council meets regularly to represent the children’s views. Our inclusive sports programme ensures that all pupils are included in a wide variety of sports activities. This helps them to develop healthy lifestyles and to value teamwork. The sports teams that represent our school achieve regular local, regional and national success.